I plan on doing something different with my Marines. I want to try and only paint the details (such as border lines and emblems), leaving the armor the grey plastic color. Of course, several of my minis have already been painted or are resin, and so I want to know if there is a color of grey that matches the plastic of most GW models? This is mainly to help correct stray marks here and there from the painting of details, and to get the rest of the army the same color scheme. This kind of color scheme has probably been done already, but I find it an interesting challenge. Would it even be considered as a color scheme, due to the fact that 90% of the model would be bare plastic? Sounds kinda lazy. The thing I find is paint will not stick well to bare plastic and will rub off like crazy, by even just picking them up. 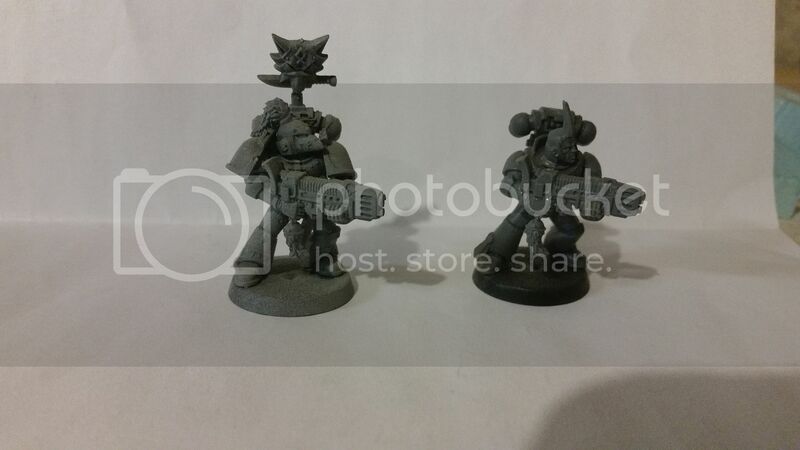 If you are going for the gray armor look I have used a gray rustoulm (how ever you spell it) for my space wolf and I have to look twice to see if the model is primed or just bare plastic. Another thing is the color of the bare plastic. Most of there products are the same stuff but I have had several sets that were a much lighter gray. You used spray paint? I suppose that could work. But yes I do want grey as my main color. More on the side towards silver, with gold trim. Huh neat. Looks like the primed one is more grainy.